The AP900Ci Aftermarket Cruise Control kits Cruise Control allows the driver to cruise at a desired speed by monitoring the vehicle road speed and by finely adjusting the vehicles throttle to maintain that speed. Options of different control stalks and command modules with set, accelerate, resume, decelerate and On/Off buttons (CM35 has additional coast and memory features). All stalks and command module allow you to tap up or tap down the set speed by 1kph/0.62mph. 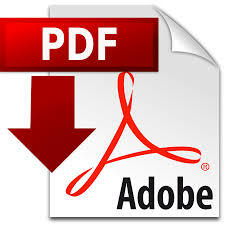 • Helps to reduce fuel consumption and exhaust emissions (lowering your carbon footprint). • Allows you to concentrate on the road and not your speedometer. • Helps avoid unintended speeding. • Allows you to set a maximum vehicle speed limit in safety camera enforcement areas. • Reduce driver fatigue and enhance driver comfort. • Depressing the brake pedal. • Press the OFF/Coast button of the command module/stalk. • Over-rev protection of the engine when a clutch switch is fitted (manual gearbox optional). • Decelerating to below 75% of the set speed. • Over speed dropout (150% of the set speed). • Brake light bulbs or brake light fuse failure. 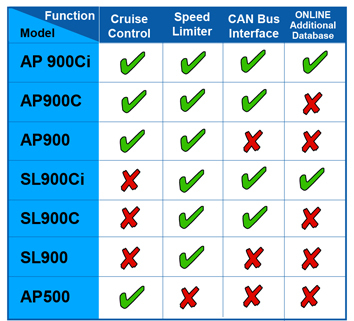 The new AP-900Ci is fully compatible with all current automotive CAN-bus systems. In order to minimize the installation time the AP-900Ci can be programmed easily with a few mouse clicks from an online database reaching over 500 vehicle applications. Tested and approved by TUV Automotive and KBA-Germany. 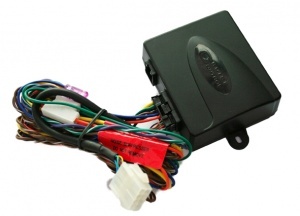 Note: Some vehicles may require additional interfaces for connection into vehicle speed signal circuits and clutch switch circuits.